Preheat oven to 240°C (475°F). Place the honey, water, lemon and garlic in a large heavy-based ovenproof saucepan. Using a small, sharp knife, score the chicken. Place on top of the lemon mixture, sprinkle with salt and pepper, and drizzle with 2 tablespoons of the oil. Cook for 20 minutes or until golden and cooked through. While the chicken is cooking, place the parsnip, salt, pepper and remaining oil in a large bowl and toss to combine. Divide between 2 large baking trays and cook for 10 minutes or until golden and crisp. 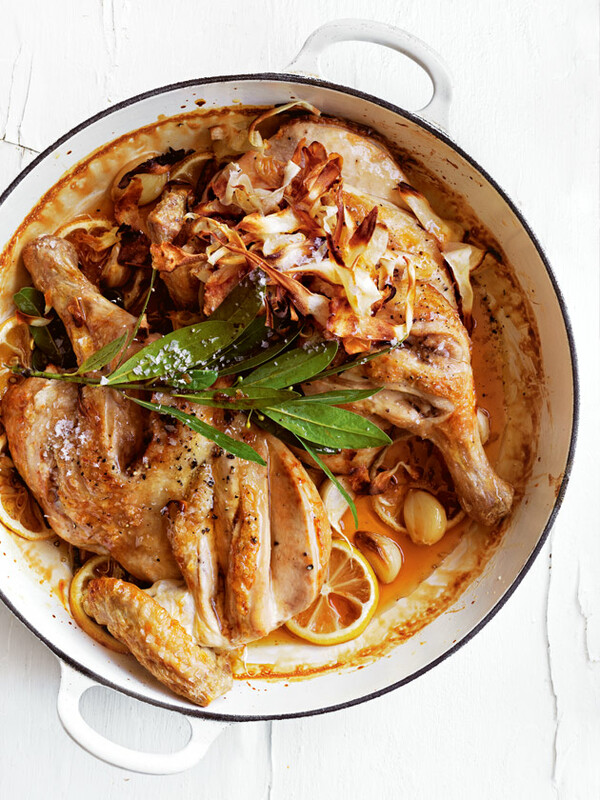 Serve the chicken topped with the parsnip chips, bay leaves, salt and pepper. Serves 4.